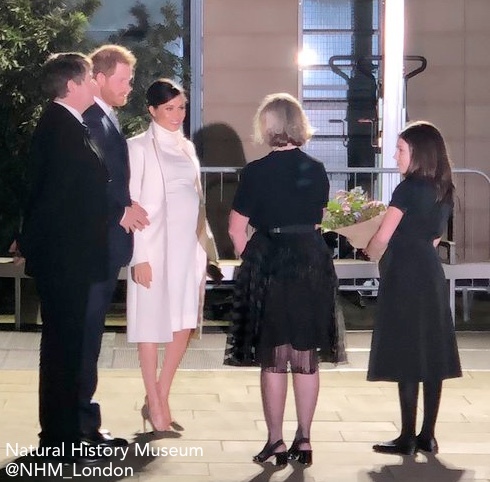 Meghan and Harry as they arrived at the Natural History Museum. 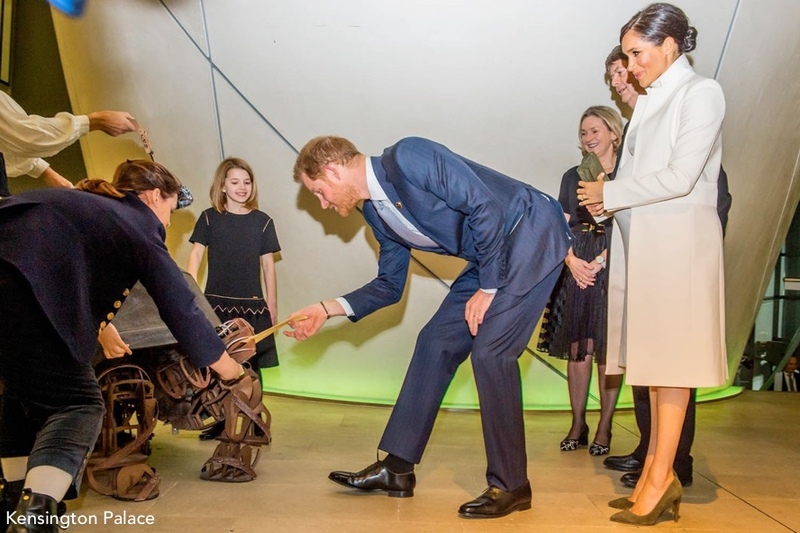 Below, you see twelve-year-old Sage shaking hands with Prince Harry. 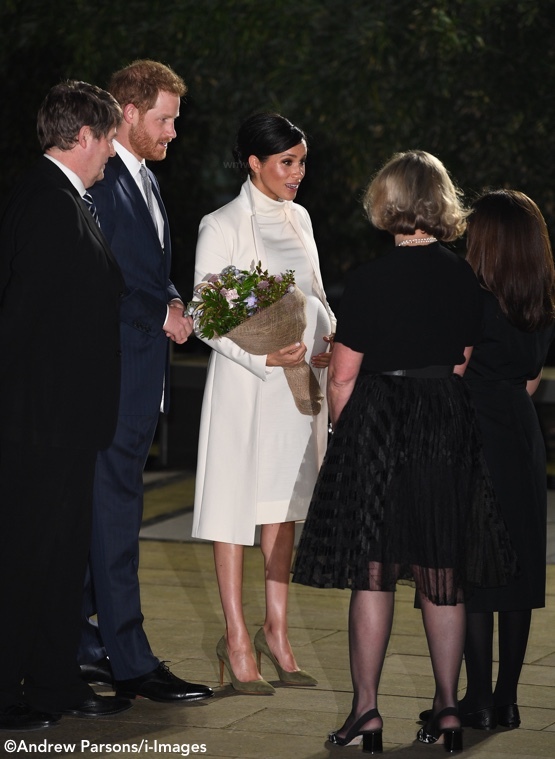 She presented Meghan with her bouquet of flowers this evening. The performance was timed to commemorate with Charles Darwin’s 210th birthday today. The production was created by Australian visual theatre company, Dead Puppets Society. 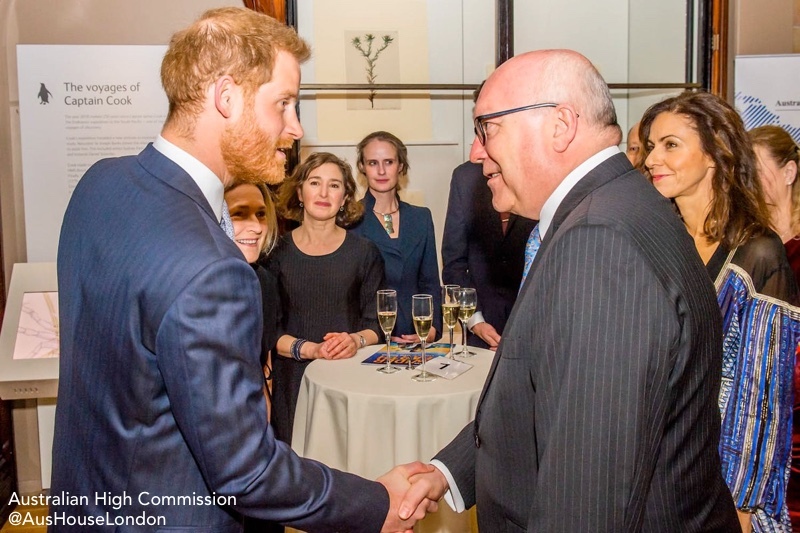 The Duke met Australian High Commissioner George Brandis at tonight’s reception. The event was in support of two related entities, the Queen’s Commonwealth Canopy and the Queen’s Commonwealth Trust. Prince Harry is president of the Trust. 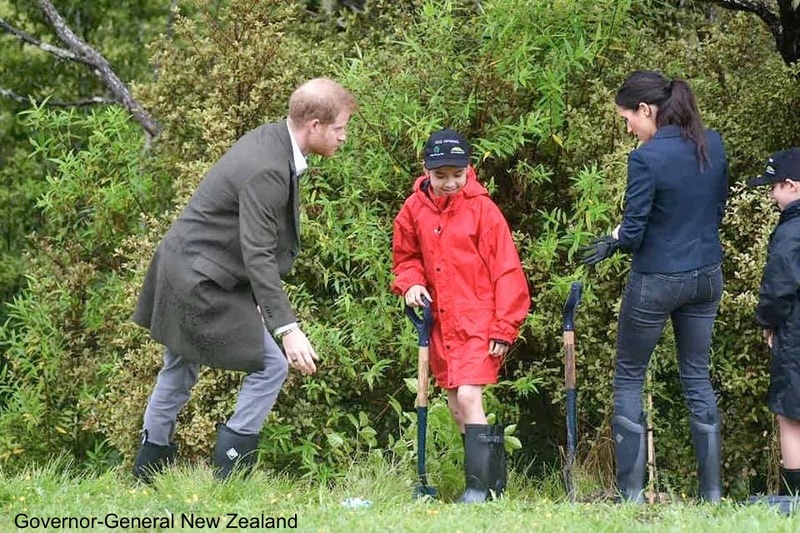 Below, the Duke and Duchess last October working at a newly designated part of the Canopy in New Zealand. In this video from Rebecca English you see the couple “meeting” one of the giant robotic puppets used in tonight’s play, the tortoise. 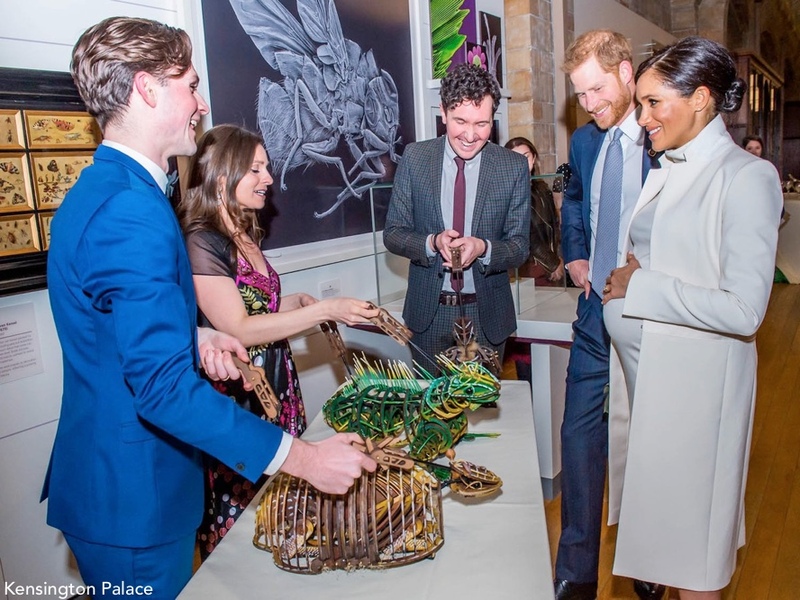 The Duke and Duchess take a closer look at models of the puppets they’ll see during the play. One of the puppets dispensing tickets for tonight’s performance. 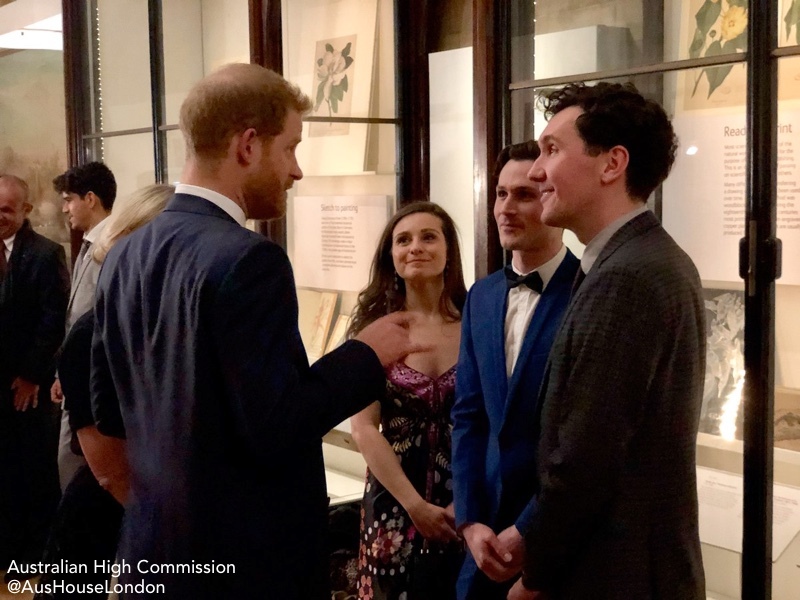 The couple met donors and children and took a peek at some of the exhibits on show, including a preserved common octopus collected by Darwin in 1832, a first copy of On The Origin of Species, and a collection of wasps he made on The Beagle and other voyages. Rebecca English posted this video of the Duke and Duchess as they entered the auditorium. This visually spectacular production features 30 extraordinary puppets representing the tropical wildlife Darwin encountered on his voyage. The production will have its European premiere in the first performance theatre ever to be built at the Natural History Museum. 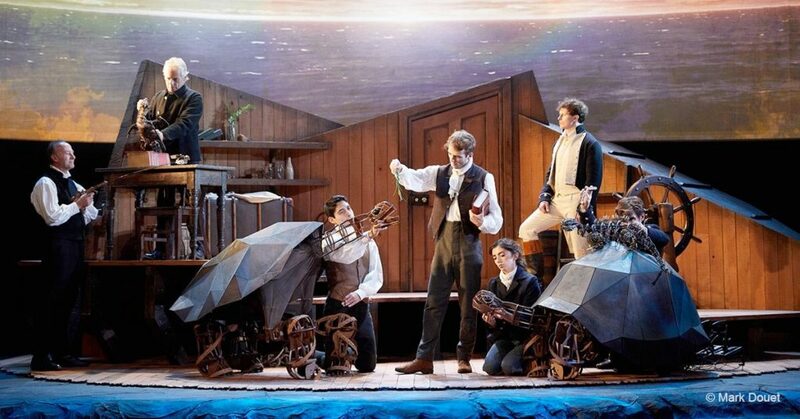 This coming-of-age story follows a rebellious young Darwin, played by Bradley Foster, who aged only 22, set out on an intrepid five-year voyage on HMS Beagle to distant and exotic lands. Here you can see some of the puppets onstage. 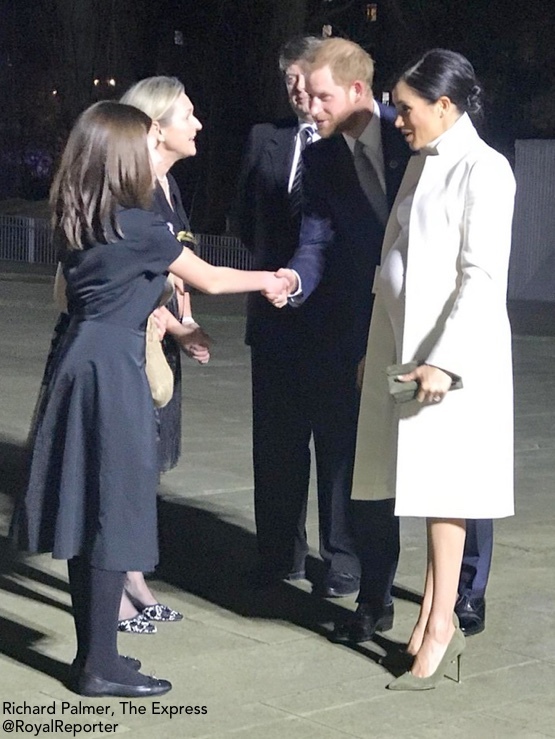 Now for our look at what Meghan wore, beginning with her Amanda Wakeley coat. 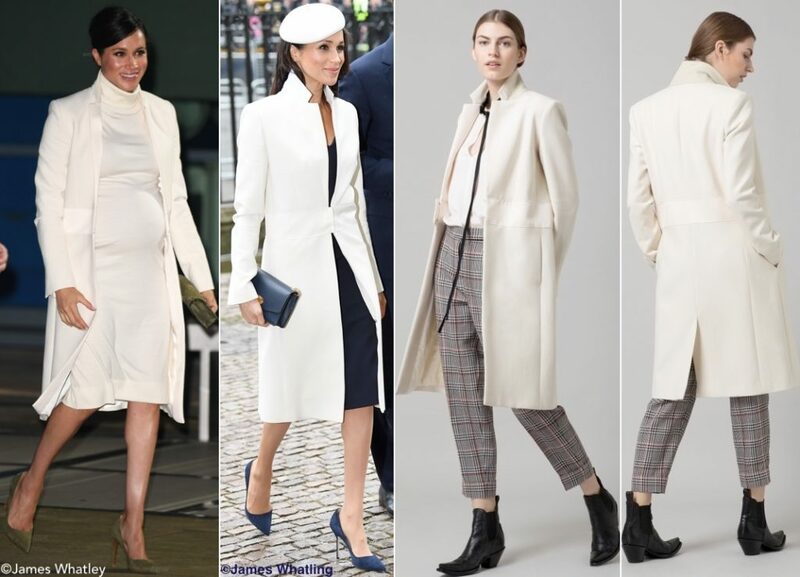 The Cream Sculpted Crombie Coat ($1190) was first seen when the Duchess wore it to the annual Commonwealth Service at Westminster Abbey last March. 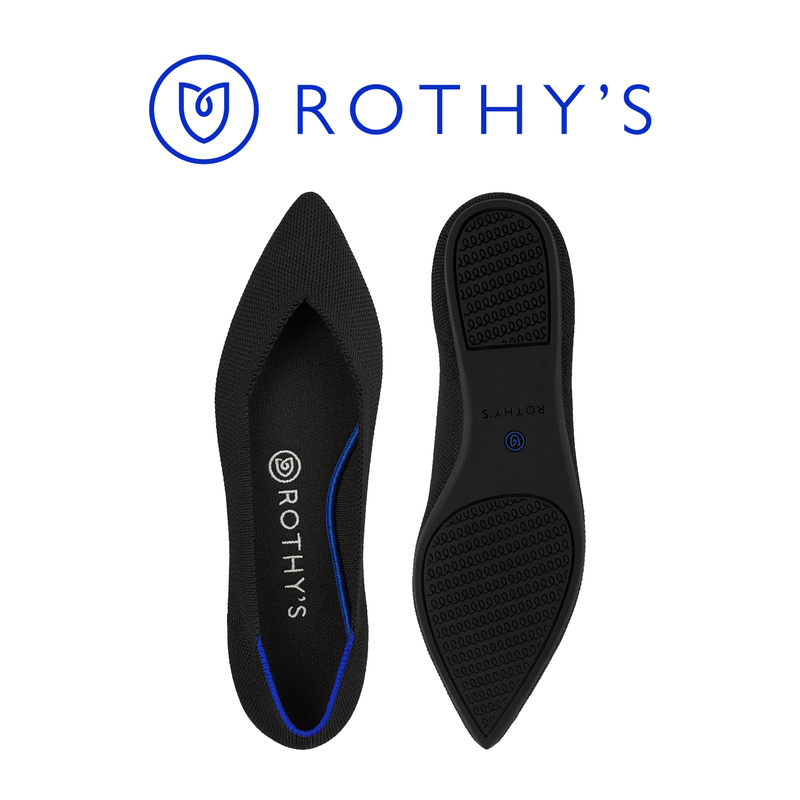 It is crafted of a poly/viscose/cotton blend with a touch of Elastane for stretch. The Crombie has a relaxed fit with on-seam pockets, a slightly flared cuff, broad waistband and hook and eye closure at the waist. 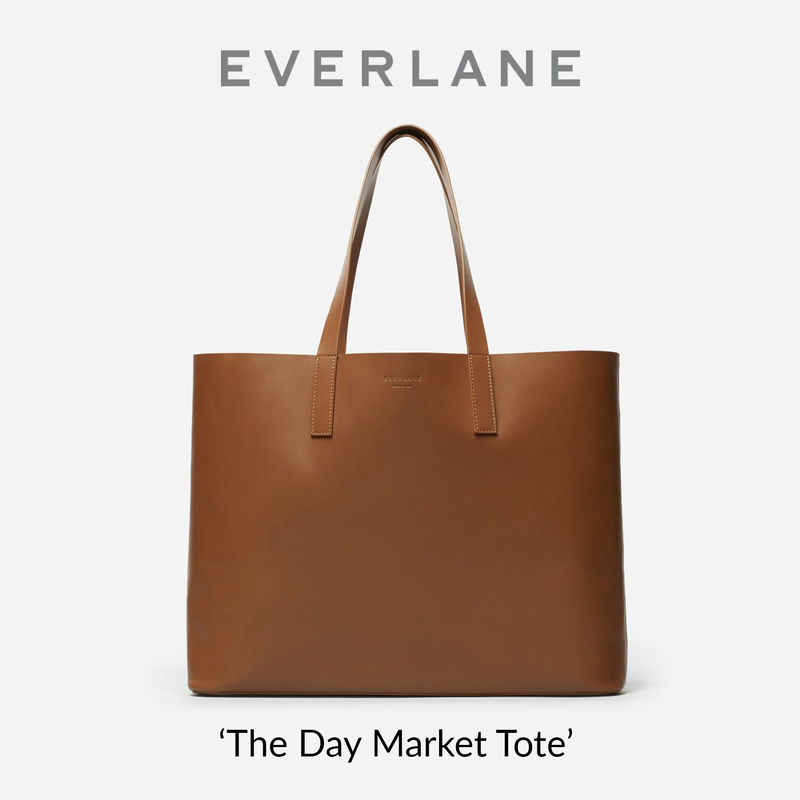 It is available in most sizes at Amanda Wakeley, and also at Orchard Mile. Meghan’s Calvin Klein dress is a variation of this style from the brand’s Resort ’19 collection. The knit piece is made of 100% virgin wool and offered in a variety of colors and lengths. We show the cream color like Meghan’s at Lane Crawford ($1900), It is also offered in the full length style at Neiman Marcus in Blue ($1900) and a Skater Dress style in black at Far Fetch ($425). Our thanks to Samantha Powell on Twitter for her speedy ID of the dress. Meghan’s design is clearly not off the rack, as the pieces shown above all have the 205W39NYC logo embroidered on the left side of the collar. The brand’s chief creative officer, Raf Simons, started using 205W39NYC for runway collections. Mr. Simons was at Calvin Klein for less than two years; he left in December, well ahead of his contract expiration. It is the address of the company’s corporate offices and a symbol to many of what went wrong during his tenure. Meghan’s shoes are by Ralph Lauren, the ‘Celia’ Suede Pump in Loden. We saw the shoes first worn in July for Prince Louis’s christening, and again in Tonga during the royal tour. 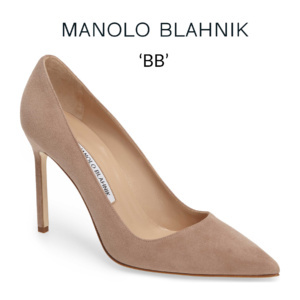 The shoes are available in calfskin pale blue, $625 as well as black suede, $575. 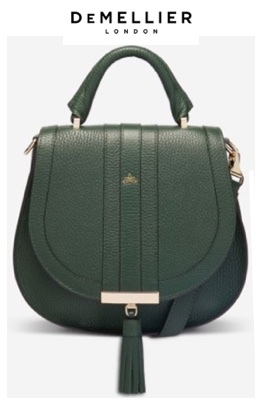 Meghan carried her Ralph Lauren clutch in the loden green colorway that we saw in Bristol. 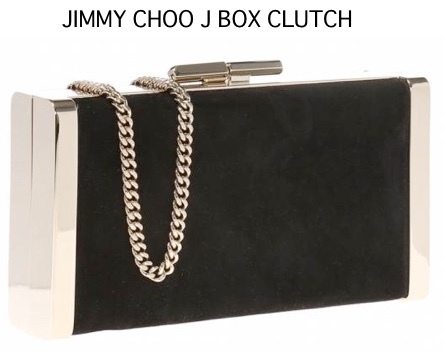 It is a version of the Ricky style crossbody. On the left we show the bag this evening and on the right, as Meghan carried it when visiting Bristol. 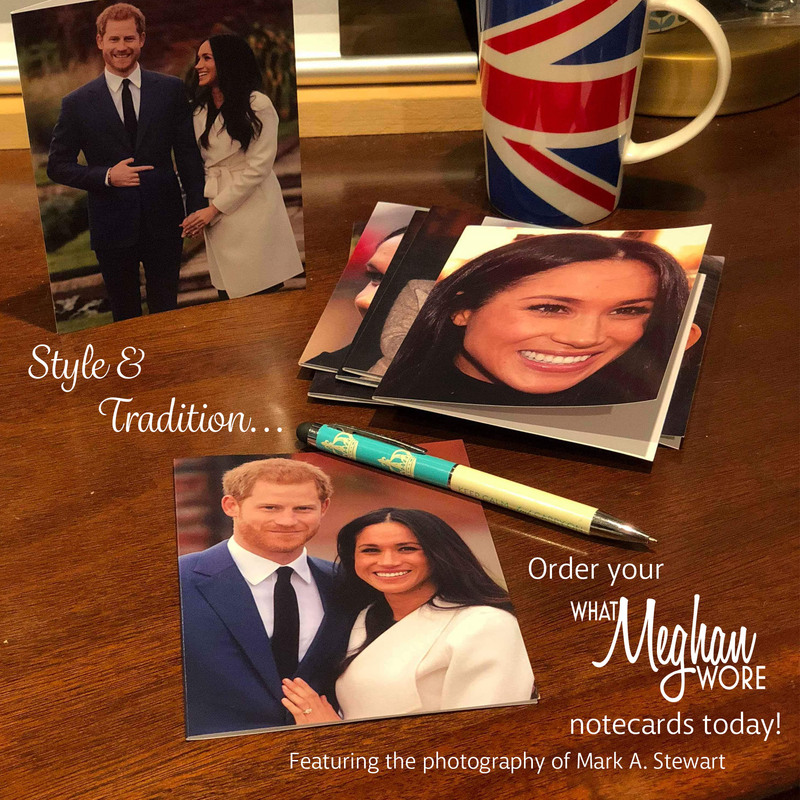 A ‘thank you’ to Elizabeth of Meghan’s Fashion for discovering the picture of Meghan’s clutch. The Duchess wore her Precious Clover Charm Stud Earrings by Vanessa Tugendhaft again. We will be updating with more photos and information as it becomes available. I love Meghan’s maternity style. I know others have not been fans, but I closely identify with Meghan’s style choices in general (particularly loose-fitting and oversized looks), and I’m happy to see that she is retaining an individual sense of fashion even as she joins one of the most-watched families on earth. She is poised and beautiful, and I’m glad for the risks she takes. I generally do not prefer tight fitting knits during pregnancy but Meghan just looks magnificent. The color, length, and classic silhouette make this a definite win for Meghan, and I love the pumps as well. One of the patterns I like best about Meghan’s wardrobe is the length. I dislike the ridiculous hemlines that seem to saturate the market these days and I love that Meghan rocks out with a true knee-length. If you’re going to stick to non-maternity pieces during pregnancy, then a stretchy knit is the way to go. I was surprised to find this wasn’t a maternity dress, though I wonder if Meghan already altered the length and the logo on the neck, if the tailoring wasn’t also slightly adjusted to accomodate the bump. I don’t think there is much pulling and stretching going on, at least not to the extent of some of the other pregnancy outfits we’ve seen. The coat is a great complement to a cozy dress and takes the elegance up a notch. I wouldn’t have thought to pair olive accessories but they do work really well, creating enough of a contrast without being too jarring. 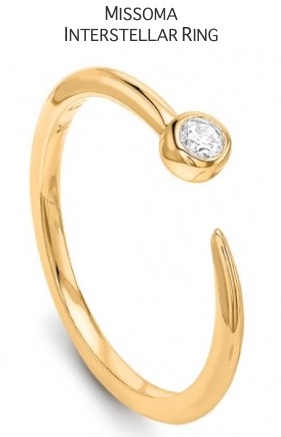 My only quibble is with the earrings, as I don’t think rose gold works very well with olive. Overall, a fantastic look and certainly one of the best we’ve seen this trimester! I love most of this outfit, but not the fit across her bust and belly. Again, maternity clothes would be so much more flattering right now. However, I love the winter white, and I’m so thrilled to see that beautiful Amanda Wakely coat repeated! Agreed that actual maternity wear would fit better, but frankly the difference would just be marginal anyway, given the already high quality look and construction of Meghan’s outfits. So I agree with her decision to not invest heavily in a maternity wardrobe, when existing ‘regular’ clothes do the job almost just as well. She always looks beautiful and presentable no matter what she wears. Love her in winter white. LOVE her hair neatly pulled back and the side sweep of her bangs makes her hair and face so much more beautiful. As with all other opinions,so it seems, she is looking almost painfully pregnant. A soft drape over the belly would also look elegant and not mama looking. I wonder if she will ever wear a maternity dress. The shoes, handbags and makeup all lovely. Still think her earrings are way too small. Wonder what that is all about?? She has more outings and can not imagine her due date as April so she will continue to grow. But over all the coat did a good job of covering the clinging dress and balancing out the bump. She just really doesn’t want to wear maternity clothing, does she? I like the idea of a creamy-winter white outfit, BUT , Meghan once again is having difficulty finding pieces that fit properly. I am so puzzled at how her stylists and even Meghan, don’t see this as a problem. With just an inch more fabric in the bodice , this dress would drape in such a flattering way…and not look like a maternity type dress. This is lovely, simple and classy, but it feels so elegant and over the top.. in a good way. I will always love those green shoes and its nice to see repeat pieces. M continues to gracefully go through pregnancy with style. I didnt know this even was happening so I was surprised to see the email. I thought her engagements were almost over with with it being closer to the babys due date. Good to see them out anyway! My personal rule of thumb regarding maternity wear is: If you can see the shape of the belly button, it’s too tight. Other than that, this is a lovely look. What’s wrong with a prominent belly-button? Pregnancy is beautiful, so why be ashamed of one’s pregnant (or even non-pregnant) body? I’d care more about whether or not I was comfortable while pregnant than a silly little thing like this. A lot of people are talking about winter white and how beautiful it is but I don’t think this is fit for an evening. She loves dark blue so I was hoping to see a great long dress. Instead the dress she chose is ill-fitting and l agree that maternity flowing dresses as so much more elegant. It’s hard enough to look good at that stage. Wow! Love the winter white ensemble! I think this was such an elegant look from top to bottom. I love the side swept updo and her make up. I actually think her dress fits quite nice. Yes it is form fitting, but I feel it has some better tailoring than previous dresses. I would not have thought to pair olive green accessories, but I find I like the look and it fits with the theme of the engagement. I really like this look, she looks gorgeous and glowing. I need to know what highlighter she is using because it looks amazing! 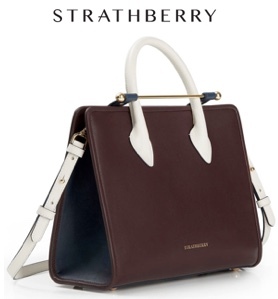 This is the perfect example of how simplicity can be glamorous. There isn’t one specific component that stands out, but everything together, when combined with her beautiful pregnancy glow and poise, adds up to perfection. I’ve seen a number of comments over the past few weeks critiquing Meghan for wearing form fitting clothes while pregnant. I’ve mentioned this in past comments, but I’m pregnant with our first child and I think I’m just a couple weeks further along than Meghan. Prior to pregnancy, I never understood the more “bodycon” maternity styles as I thought they just looked uncomfortable. But as I’m entering my eighth month, I have to say that I really love how I feel and look in the my more fitted maternity wear (and I’m not blessed with Meghan’s lithe frame, either). I love my quickly-expanding belly and wearing loose-fitting maternity clothing just makes me feel dowdy and like I’m wearing a potato sack. I recognize that every pregnancy and every mom is different though…this just happens to be how I feel. Perhaps Meghan’s choices of fitted maternity wear is a reflection of her appreciation of her changing body and her clothing choices help her to feel more confident and poised during these outings? Good for you! Love your comment. Congratulations on your baby. The dress (like pretty much all of the others!) doesn’t fit through the bust and belly. You can tell by all of the fabric wrinkling and pulling around that area. There are body-skimming maternity dresses that are designed with extra room in those areas. She is glowingly gorgeous in this warm winter white shade. The extra height and side part in her hairstyle is lovely. I just love the winter white outfit with the contrast shors, looks amazing and so elegant. Love the way Meg shows off her pregnancy, she is blooming. 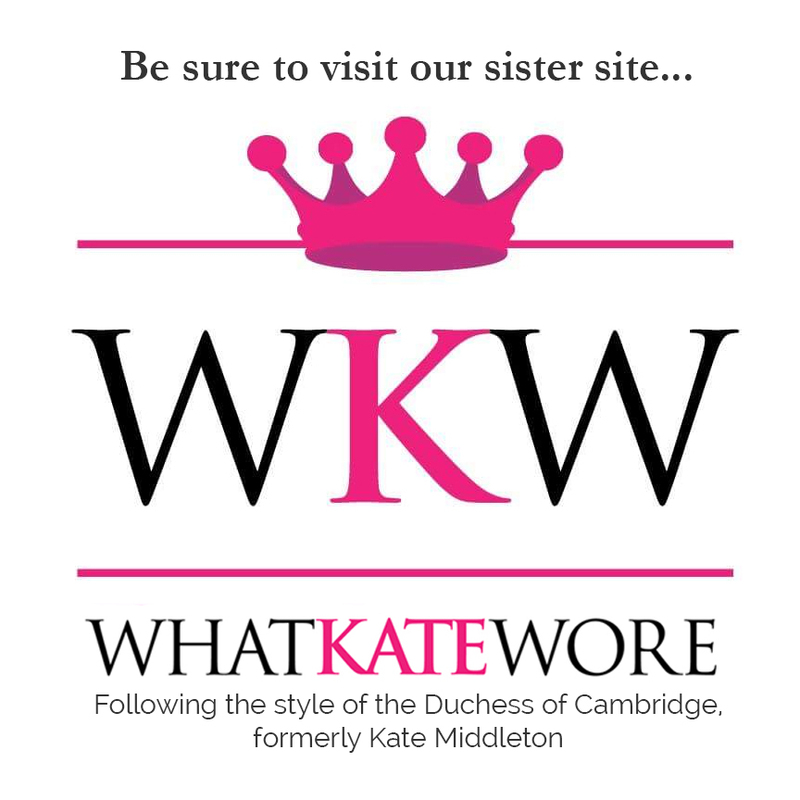 Get the giggles when I read about so called royal protocol and how she doesn’t adhere….is there a published list or just a perceived standard amongst royal watchers. Anna, I seriously doubt there is an actual list of what to wear…just expectations. There is nothing written to say you can’t wear a bathing suit in church…but nobody does, out of respect. As far as royalty goes, we each have our own expectations and standards. I guess that is why we often disagee as to what is appropriate. If I were a new member of the Royal Family, I would take my lead from the Queen. If she was wearing a hat, so would I. Ditto for hose. But of course the Queen is 90+, so being age appropriate is also a consideration. I would also seek advice from others in my age group in the family and seek help from long standing staff members. It is very hard to balance one’s own style with the expectations of others. Bonnie, you need to go to the tropics, lots of people wear bathers to church usually with a coverup eg sarong, loose shirt etc. No one cares and they sit in amongst churchgoers in shorts, skirts, singlet tops, board shorts and thongs!! If I was a newbie to the royal family I would still want to have my own identity and I am sure the queen encourages that across the younger royals. Just remember that your expectation is very different than the person sitting next to you. I think there is far too much pressure on some of the newbies to perform according to some old tradition that is a perception amongst the flock but not enforced by the inner firm. i am sure the firm is well aware that the actual function, charity, event is far more important and to be celebrated that whether or not you are wearing hose or your pregnant body is on show. I think the winter white outfit is stunning, the dress shows off her pregnant growing body and wow to be that confident and look absolutely smashing is admirable. I think the outfit is OK, maybe a little bit tight but I don’t like her make up. It’s to much. To mux glow, to much highlighter. She is shining in every picture – so the whole combination is not my favorite. I telly hope she get some rest now. The pregnancy looks uncomfortable at this time. I wasn’t crazy about this outfit but read all of the positive posts, so took another look at the photos. I think the dress is really too tight around her belly and not a perfect maternity look. Grazie per il vostro lavoro chiaro ed esauriente e soprattutto privo di giudizi e commenti cattivi. È l’unico che fornisce informazioni complete sugli eventi e sui vari progetti (oltre che sul look di Meghan naturalmente). Buon lavoro. Confermo. Un blog di moda molto ben gestito, anche se parte del merito va senz’altro all’alto livello dei commenti tecnici, sempre professionali e puntuali anche nelle piccole critiche agli outfit. I commenti fuori contesto vengono cancellati e ciò consente di mantenere un profilo alto. A sophisticated polished look. One benefit to Megan’s maternity style is that it’s easy to baby watch. Looks like that baby starting to move downward. So, I feel like this is the third time we are seeing this look. The first time was the H&M version which was super casual and a bit edgy for a Royal, then the more upscale Brandon Maxwell version for the National theatre event and now this offering. Here, the Duchess has finally perfected the look and yet stayed true to her style esthetics. The fit is perfect, turtle necks are universally flattering, Winter white is very chic and the olive accessories add the color. I am loving the Duchess’s variations on her updo. I am so glad you included the side by side pics of the Duchess wearing the coat pre-pregnancy and now. At first glance she looks like she’s all belly, but with the side by side pics you can clearly see how she has changed during the course of her pregnancy. Meghan manages to look both understatedly chic and absolutely glamorous at the same time. Not enough adjectives for how much I love this look! Forgive me for being in the minority. Her face looks glowing and hair is lovely. However, I prefer more flattering fits on garments and hope she gets the cue after pregnancy as it can be so challenging regarding fit especially at this time. I also admittedly prefer a more modest “bump” in clothing given her royal ranking. She has endless resources for great tailors and I hope she adds one to her amazing friend brigade in the future. I remain optimistic and supportive – and follow along with each of these wonderful posts, in support of the women behind the clothing and looks, always. s o f t . The loden pumps and clutch add to that comforting and gentle vibe. A very lovely look from head to toe. this is a beuatiful look for meghan…my favorite so far of her maternity non formal wardrobe. I hope she is doing okay given all the heat she has been getting over social media. Forgive me, but I dislike form fitting maternity clothes at this stage of pregnancy on anyone, including Meghan. I like the all white look and the olive accessories, but please wear maternity clothes. Love this look. She is beautiful and so well put together. I think the monochromatic white is elegant along with the moderate touch of color with the olive green. I also love her minimalist jewelry. The look says elegance and sophisticatication very well. I also love her hair today. Very pretty overall. Great outfit from Meghan today! The monotone white is really lovely and powerful. I am not and will never be a fan of turtlenecks, but Meghan makes it look cool by keeping the collar of her coat popped up like that. Very chic. Anybody catch Harry holding her hand as she starts to walk up the stairs in that video? So freaking sweet. They’re adorable. I can’t wait to see them as parents. This! This! Yes, Meghan! The Duchess is on point today, head to toe! Nice to see the hair is looser and asymmetrical with some lift at the crown, it balances the body shape much better than the slicked look, very elegant. Makeup and skin glowing as usual, so perfect that it’s almost too boring to mention 😉 The structure of the jacket specifically the collar, the simplicity of the monochromatic pairing of dress and coat works so well on her. The styling doesn’t try too hard and the execution of this outfit is flawless. She looks comfortable and poised. A+ !! This is my favorite maternity look on the DoS. I’ve stated before I don’t like the body hugging maternity clothes but the Dutchess is going to wear her clothes that way so I need to get on board. It’s nice to see how happy she looks. 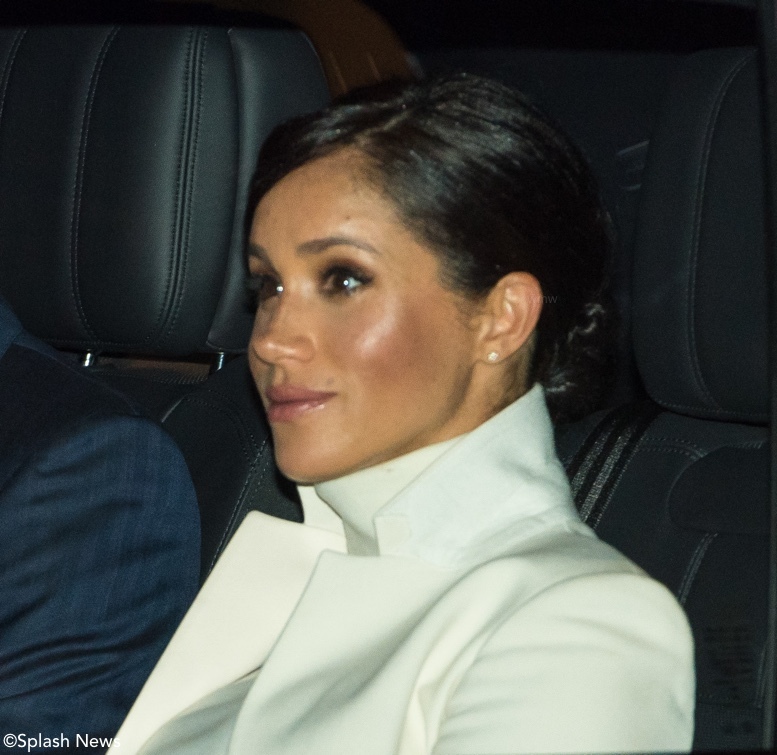 this look is a home run –best of Meghan’s looks in my opinion. Even her hair looked elegant which usually shows a clump of hair falling across her face or in her eyes. Love everything about this look. It’s timeless and elegant! First time commenting on WMW as I am often underwhelmed with her choices. Tonight she looks fresh and fierce. This is what I’m here for. The winter white combined with the collar and turtle neck look so sharp. The side part is also very flattering! Love it. I think Meghan looks very nice and I like her hair. Love this look. The dress looks like it fits better than other of her “maternity” clothes. Makeup and hair on point. I love the monotone coat and dress with her sleek and voluminous hairdo. The addition of the modern green shoes and clutch were perfect. The stretch of the dress works with her shape and seems comfortable. Such a lovely dress, CK might need to offer a shorter version because we’ll all want one. The olive shoes and clutch add a nice bit of understated color with the cream coat and dress. Her makeup and hair also look lovely. It’s a polished, professional look, in my view. Meghan looks fabulous tonight. New York chic has met UK creative and given a match made in heaven via a slick Calvin Klein shift and the innovative Wakeley coat with its on-seam pockets and contrast waisband. I am so glad to see the Wakeley again, it works really well for evening by being simple and uncluttered, and wears well left open. The white on white combination has a sumptuous undertone, perfect for evening. This is minimal at its best with the subtle Ralph Lauren olive accessories for understated contrast. If I had a quibble it might be that the high neck makes Meghan look chubbier in the face than usual, but then she is expecting and therefore allowed to expand gently in all directions. Her hair is brilliant, I’m just delighted to see another side-part with a faux fringe across the forehead, it frames her face beautifully, and the rest of the updo is so elegant. Those tiny, exquisite earrings are spot on, and Meghan is simply glowing all over which is a delight to see. I also love her hair- the side part updo is so flattering, and just suits her so well. I also like her messy top knots and her super sleek ballet buns, but I love this style the most, especially for an evening occasion like this. I typically like her hair and make-up, but wow! I love that she mixed it up! I didn’t feel like she needed a change but I love the dewy make-up with a side part. The cream with olive accessories is pretty, though nothing unexpected from her. But I don’t mind her staying with her typical palette given her pregnancy (time to feel comfortable! Not experiment imo) and the change in the make-up and hair. I think this is lovely. The coat is beautiful, and although the dress is a little formfitting for my taste, she can carry it off. I really like how she is doing her makeup lately. The pink lips and the smoky eye….beautiful. I really want to like this look. Winter white can be so chic, and the suede forest green accessories are a great match! What’s bothering me, though, is the fit of the dress. Now, you can call me old-fashioned or conservative, and that’s fine — I don’t like being able to see the shape of a navel through a dress. Yes, I know she is pregnant, and it is hard to conceal a navel after it pops, but many women have found ways to do so, and Meghan, who is a savvy dresser, can also. That said, I hope she and Harvey enjoyed themselves tonight. It must be an interesting event! While the Duchess looks beautiful, I just cannot get on board with the form-fitting clothes worn while quite pregnant. Call me an old fogey! It must be the style because you see it everywhere but I don’t think I’ll ever warm up to it. I agree with you! And I’m quite young, not an old fogey! Tight-fitting clothing are not my jam, especially during pregnancy. I’m on the fence with the bodycon maternity wear, but I think this one was looser than what she has chosen and with a heavier weight fabric as another person mentioned, it seemed more polished. I also agree the look was a bit casual for evening, but I also think she does casual wear the best now. In her pre-Duchess days, she really did evening events in such a stunning way and seemed to experiment much more. On an unrelated note to fashion, Meghan’s fuller face really suits her. She always looks younger than her actual age, but here she looks absolutely cherubic somehow. Meghan is resilient. In spite of the drama about her in the tabloids, she always looks radiant and happy. I like her in cream and the olive shoes and purse provide a nice contrast. Even though the coat and dress are not a set, they go well together in colour and texture. Her dress has wrinkles and doesn’t fit properly, because it was not designed to be maternity wear. 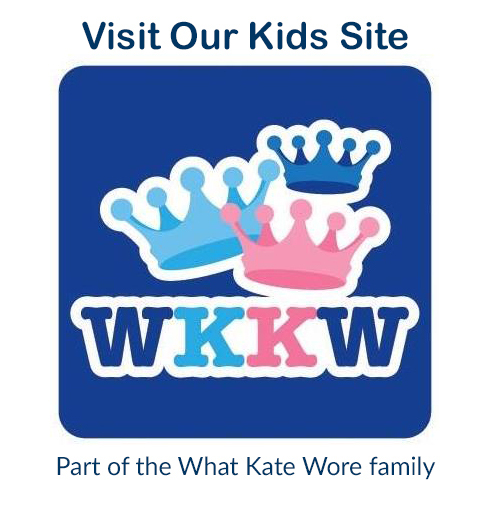 When a royal or a celebrity wears a certain line of clothing, sales of that item usually increase. I do wonder if design houses like Oscar de la Renta, or Calvin Klein, are thrilled to see Meghan wearing their clothes, or if they cringe to see their clothes stretched or wrinkled to accommodate a pregnant body? Meghan is a beautiful woman perhaps that is all that matters. I have to admit that I was a little disappointed not to see something a little more evening-y at first, but this is STUNNING and exactly the sort of casual, understated elegance that Meghan is so good at. I thought that this coat was a bit underwhelming on Meghan at the Commonwealth Service, so I’m excited to see it recycled here (and impressed by how well it translates to more of an evening look). The dress is gorgeous and makes for a nice silhouette and I LOVE Meghan’s more dressed-up bun. I think that a metallic or velvet shoe and bag would make for an objectively better look, but I do like the khaki and white together (and as much as I love shoes, I’m not going to be too critical of the specific pair of 4″ heels that a seven months pregnant woman is wearing). On a less fashion-y note, it’s kind of fun to have a reason to look back on the Commonwealth Service last year. Meghan (very understandably) looked a little shell-shocked that day and at other points last spring, and looking at those photos makes me realize just how well she’s grown into her role. I imagine that she may not be having the greatest week, but the poise and class with which she carries herself continue to impress me and I really do hope that she and Harry are doing alright. Meghan does monotone cream so well. The simple dress and coat combo is very appealing and I wish I had these pieces in my closet! Love the unexpected loden accessories, too. Brava. I like this very much. It’s reminiscent of the all-cream outfit she wore relatively recently, with the Armani coat and the H&M maternity dress, but I like this dress much better. The heavier all-wool fabric is much less clingy and hence is not riding up in the same way. That said, it still strikes me as a *skotch* too tight–pulling across the bust. But that really is a doozy of a bump that she has there–all up front and up high–and she may be at the point where almost nothing is going to fit right. I complained recently when she wore the Givenchy coat open in front, but I think this one works a lot better. It strikes me as a coat that is more or less designed to be worn open, which I didn’t think was true of the Givenchy. I thought it was rather brilliant to pair the white with the olive accessories. For all that people complain about the DoS avoiding color, I think she actually has something of a genius for mixing subtle hues like this. This is a nice look for Meghan! I know some people seem to not be a fan of her maternity style but I think the fit of this dress looks just fine. And I’m guessing it was cold if she opted for a wool turtleneck dress! It’s a very professional look. I also did not recognize the coat from her prior appearance but it looks way different now that she’s pregnant! I assume it’s probably hard for her to keep it closed but I like the idea of wearing it open. And nice pop of color with the olive shoes and clutch. Also I like how she did her part (I think she’s just wearing a plain bun?) in the old-timey upsweep. And the puppets are very impressive! I have a friend who works at a puppet museum in Atlanta. I actually really hate puppets but she made me go to the center’s puppet show (I felt like I owed her since she was hosting me and got me in for free). I had to go alone though which was kind of awkward given that all of the people were school groups of children hahaha. While it was not my favorite thing to do, the skill and the artistry of the puppeteers was pretty amazing.